My name is Mardell Denney. I purchased my first Akita in 1985. A show dog, and the foundation dog of my kennel. We called him Jer Mar Nite Gamblr O' Sashimo, "Gambler" for short. He finished his championship in May of 1988. He was not only my foundation dog and family companion, but he was my best friend. He was bred very limited and unfortunately we lost him at the age of 4 years old. He took with him my heart and left me with his kids to carry on his legacy. Several of his kids went on to be great champions, and unfortunately they all have been retired or have passed on. The surviving offspring are living out their lives in relaxation with their current owners. In March of 1989, I had a litter out of Sashimo's Flashdance and Ch. O'BJ Striped Kareem of Skylake. In that litter came my other foundation dog, the dog I called "Awsom". Ch. Jer-Mars Totally Awsom finished his championship in January of 1993. He passed away after a wonderful 11 years. I have personally handled over 40 dogs and guided them to their championships, most of which came from my breeding program. My most notable triumph was in January 2000, when I took Winners with my male, Jer-Mars Knight Rider "Kit". Winners with my female, Ch. 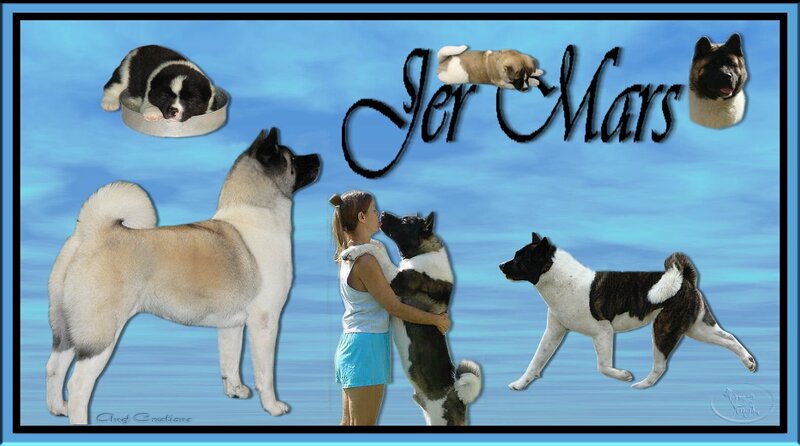 Jer-Mars Rech-N For The Stars "Chyenne", and Best of Breed with my male special Ch. Ranmor Sky Writer of Akiko "Mochi". Mochi continued on to take a Group 2 placement that day. In 2000 "Mochi" was consistently ranked in the top 5 Akitas by breed points, as well as group points nationwide. He was the # 1 Akita in group points from January to June. He received his Award of Merit (AOM) at the Regional Specialty at Burbank in June 2000. It is out of these two males that I have my pride and joys. First, and foremost is Ch. Sun-Rae Brisco County Jr., who I co-owned with his owners Ed and Melissa Young. Brisco had a wonderful temperament and sweet disposition which made him a great companion as well as a wonderful show dog. He was specialed on a limited basis. Sadly, he passed away days before his 15th birthday. Then we come to Ch. Jer-Mars Universal Play'r Sun-Rae. He is my "Mochi" son out of Sun-Rae Riden On One Of A Kind. Play'r made a big impact with the judges and Akita competitors. He loved to show and that makes it even more fun. Play'r was specialed locally throughout 2005. He is also loved and co-owned by Anna Sanchez of Sun-Rae Akitas, as well as Wayne L. Davis, D.V.M. of Small Animal Hospital in Riverside, Ca. We occasionally have puppies, as well as adult dogs available. We also have information regarding dogs that have been rescued by Akita Rescue groups. They make great family pets. Please feel free to email or call if you have any questions about the dogs pictured on my site, or Akita questions in general. We look forward to hearing from you. Copyright © 2010-2012 Mardell Denney. All Rights Reserved. All photos and graphics belong to Mardell Denney, & Linda Logan. You can not use photos or graphics without our written permission.